Many drivers and wives complain about there not being enough money coming in to justify you being away from home and out over the road. That is understandable. What many new drivers don't realize is there are ways to increase monthly income both by how you do what you do and what you don't do. 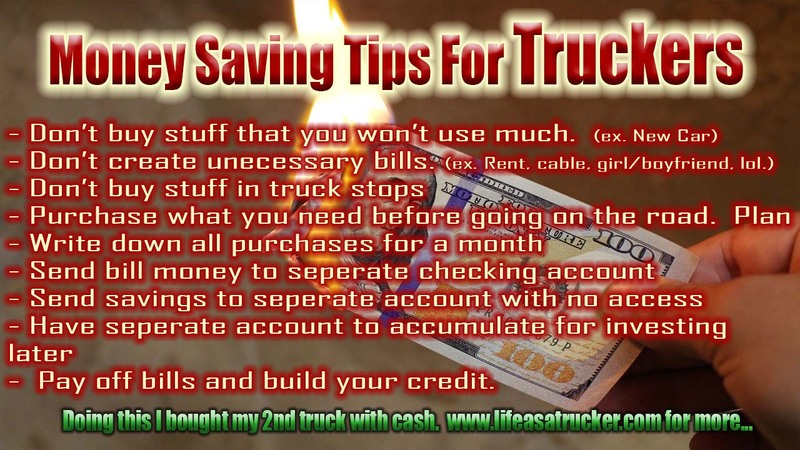 Three of the easiest ways to make more money as a new driver is to be dependable so that you can get pre-planned on loads. Also delivering early if you can so that you can go on to the next load will help you. Last but not least, sleeping at the shipper or receiver to get in line first to be loaded or unloaded. This is especially important at first come first serve spots. Some of these things are not what you wanted to hear. It is possible you thought there would be some magic or secret method to taking more money home. It is not. A lot of common sense but some of it is simply improving on how you currently do things. Some things however, require having more insight to get it. For example. Be on time every time. Drivers will tell you that doesn't matter. They can't think. It DOES matter because if your dispatcher can't determine you are reliable and dependable, they won't find you the next load until you are empty. However, if they know you are the type of person who will be where you supposed to be when you are supposed to be there, they can have another load ready for you before you even get empty. It's called pre-planning. Each suggestion by itself represent only a small increase in monthly income. If you do all of these things together you are talking about a significant amount of money extra each month. Most of this extra income comes from savings. Any company will tell you saving is $1 for $1 to the bottom line. If you earned more it's taxed and less to the bottom line. That's why they cut so many corners to save and penny pinch.